Turmeric's warm aroma, bright color, and gingery/peppery taste are relied upon in cooking throughout Asia. It's best known as the spice that gives curry powder its distinctive color, but it also has great medicinal value. The dried stems, leaves, and flowers have been traditionally prepared in tea infusions, as a compress, and in baths to support respiratory and skin health, for first aid, and to support a healthy immune response. * Don't wait for prostate problems to appear before you start using this bulk herb tea. Prevention is the key to health! This blend, formulated by Medical Herbalist Claudia Joy Wingo, nourishes the prostate gland protecting against hypertrophy while providing the body with testosterone precursors for strength and vitality. safety and flexibility. Our #1-selling multi-herbal formula provides joint support, a healthy inflammation response, and herbal pain relief. This product is not intended to diagnose, treat, cure or prevent any disease; the law applicable to dietary supplements, the Dietary Supplement Health and Education Act of 1994, commonly referred to as DSHEA, does not permit us to do so and it is not our intention to do so. The Contraindications and Potential Drug Interactions information provided on this website is not intended to be all-inclusive. Keep your healthcare provider informed about any herbal and other dietary supplement products that you are taking. Supports prostate health and healthy aging with a combination of whole herbs and whole-food antioxidants. A Whole-Food Complexed multi-vitamin for Prostate, Heart & Vision health. * Made with organic vegetables and herbs. Formulated specifically for the needs of men over 40. Easily digested, even on an empty stomach. Men's One™ Multivitamins are the #1 selling natural men's multivitamin, with potent vitamins, minerals, antioxidants, superfoods and herbs to nourish, protect and support major systems of a man's body, and promote natural energy, in just one tablet per day. Added minerals including copper, chromium and selenium support nerve, connective tissue and sexual health, and metabolism, while specially blended herbs promote prostate health. Live plant-source enzymes and probiotics (healthy bacteria) promote easy digestion without stomach upset. Men's One™ is gluten-free, sugar-free, lactose-free, dairy-free, wheat-free and yeast-free, and contains no artificial colors, flavors, sweeteners, preservatives or additives. Provides holistic support for your prostate health, supporting normal urine flow. A Whole-Food Complexed multi-vitamin for Prostate, Heart & Vision health. * Made with organic vegetables and herbs. Formulated specifically for the needs of men over 40. Easily digested, even on an empty stomach. Our #1-selling multi-herbal formula provides joint support, a healthy inflammation response, and herbal pain relief. 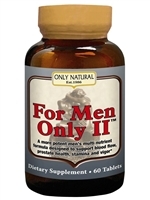 Every Man II is a Whole-Food Complexed multi-vitamin formulated specifically for the needs of men 40+. Organic herbs and cultured whole-food complexed vitamins & minerals work together to promote optimal health and condition-specific benefits-- not just address nutrient deficiencies. * Supercritical Saw Palmetto, Nettle Root, and Pumpkin seed oil work together to promote prostate health. * Whole-food complexed B-vitamin complex and whole foods like organic Oregano support heart and eye health. * Provides holistic support for your prostate health, supporting normal urine flow.